It’s good to travel alone as it’s possible to take the credit for every achievement but from time to time it’s relaxing to go to a place where you know people who know people. Through this network I had been given a guided tour of Baetulo (the Roman town that pre-dates anything in Barcelona) in the Badalona Museum. 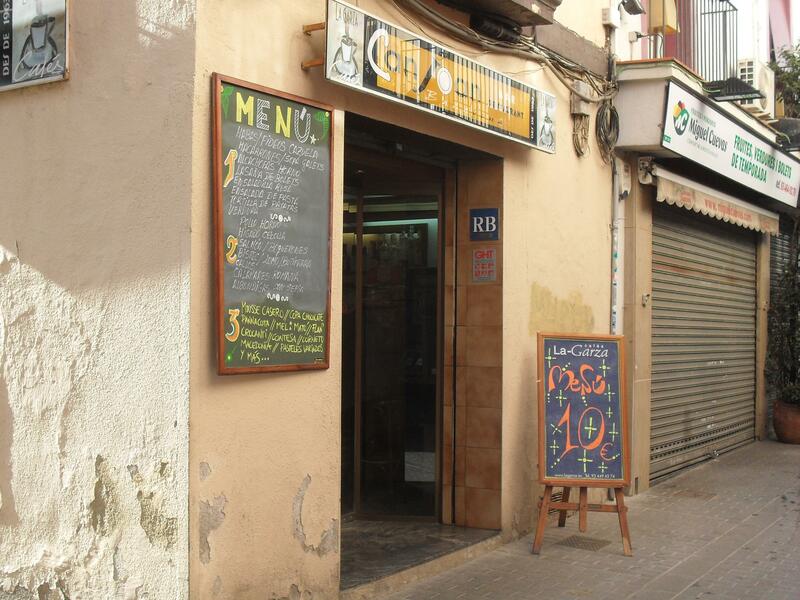 Not only that our guide recommended a place near-by to eat and that’s how, on a Wednesday afternoon at the end of February, I went for my lunch in Can Joan, Carrer del Lleó, Badalona. Now none of the places I choose to eat are what could be called luxurious. Apart from being beyond my means (unless for a special occasion – and I don’t find many of those these days) I’m not really into the atmosphere and the fawning that comes with dining with the rich and powerful. I also don’t particularly like the rich and powerful. So I am happy to find those places which serve good, wholesome and locally influenced food at a price which won’t break the bank. These places rarely are found on the main roads, in the centre of tourist areas, but you really don’t have to go that far off the beaten track to find them. Badalona is a suburb of Barcelona, at the end of one of the Metro lines and has a beach although busy in the summer months lacks the extreme commercialisation and uppyfication around the Barceloneta district of the big city. If there’s a main tourist street in Badalona it’s Carrer del Mar, a narrow street that runs from the centre of the town and ends up at the beach on the Mediterranean. It’s a narrow, quite long, pedestrianised street but contains a number of cafés, bars and restaurants as well as the normal shops in an area where people live but which experiences a visitor invasion when the sun shines and people rush for the beach. Carrer del Lleó runs parallel to that street, to the south, in the direction of Barcelona. We (I was with a local friend and my brother so have not just my own ideas to call upon this time) entered the restaurant at about 14.30 and the place was full, there being just one table free right next to the serving hatch. That meant there was a lot going on around us but it wasn’t in any way intrusive. The set menu wasn’t written down on a piece of paper, it was on a white board on the wall next to the serving hatch – and also on a blackboard outside in the street. There was plenty of choice as there were something like 10 options for all the three courses – but surprisingly no paella (although my original theory that it was there just for the tourists had been earlier blown out of the water by my Barcelonan friend, also I wasn’t there on a Thursday). This was definitely a no frills sort of place. The idea was to provide food that was filling and wholesome. For the first ‘plato’ I plumped for the fideu cazuela, a chopped up spaghetti dish with a sauce and bits of pork ribs. One of my companions chose the same whilst the other went for the tortilla, the potato omelette. Mine was tasty but too big a portion for me. For the ‘segundo’ I went for the ‘lomo’, thin port steaks, which came with chips. I didn’t choose well really as there was pork followed by pork. Should have gone for something lighter after the fideu, which I knew were normally quite filling. My companions both chose the salmon, which consisted of two thin steaks with potatoes and their clean plates would seem to indicate that they were happy. One accompaniment to many dishes in Catalonia is the aioli (sometimes written all i oli in Catalan) which is a garlic mayonnaise made with olive oil. If you like this as much as my Catalan friend don’t be shy to ask for some more, a half decent place won’t refuse. My friend was on tablets so couldn’t drink alcohol so it was up to my brother and myself to keep the flag flying. We went for the red wine (as usual – white wine comes by the glass and any extra has to be paid for) and it arrived from the fridge, as is the norm. First just the one bottle but there wasn’t any bother when we asked for a second. This, as is normally the case in these basic, local restaurants, was a perfectly acceptable and drinkable wine. It wouldn’t have won any prizes but that wasn’t the aim. The dessert choices were as extensive. By now I had turned conservative and went for the profiteroles. One choice that I really should have gone for was the ‘mel i mato’. This is a fresh curd cheese, sometimes with a slightly salty taste, over which is drizzled honey. I found it slightly bland (only trying a spoonful) but if people like to experiment look out for it on the menu if in Catalonia. The atmosphere was good, busy all the time we were there and people still coming in as we left at around 16.00. Apart from my brother and myself as far as I could tell everyone else was a local. The staff were friendly and efficient and when told that I was from the UK I ended up having a conversation with the waiter about how expensive Britain was in general, especially London, and how it would have been impossible to get what we had had there for anything approaching the €10 per head we were paying. I would recommend this place for anyone who had made a trip out to the seaside – or perhaps to see the Roman town of Baetulo – from the centre of Barcelona. This entry was posted in Barcelona, Catalonia, Food and Wine, Travel and tagged badalona, budget eating, can joan, midday menu by Michael. Bookmark the permalink. Thank you very much for all this chronicle. I agree, of course.